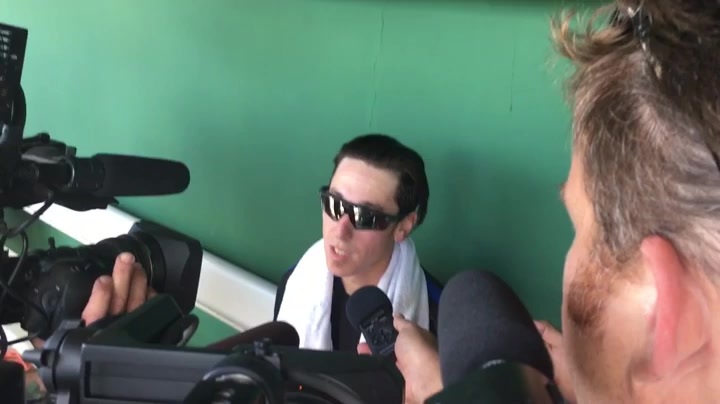 Two-time Cy Young Award winner Tim Lincecum threw pitches in front of more than 20 team scouts in Scottsdale, Arizona, on Friday as he attempts to work his way back from hip surgery. The 31-year-old free agent fired off 41 pitches, hitting 92 miles per hour during an exhibition designed to showcase his newfound health. Lincecum went 7-4 with a 4.13 ERA in 15 games for San Francisco last year but did not pitch past June and underwent a season-ending hip procedure in September. He became a free agent at season's end. Despite a decorated career that has included three World Series titles and four All Star appearances, Lincecum must now prove himself all over again. "I was able to throw strikes on my pitches, stay within myself," Lincecum told reporters. "To be honest, I feel like I could pitch for a good five or six more years until I can't anymore." Lincecum has spent all nine of his seasons with the Giants and has a 108-83 career record and 3.61 ERA. San Francisco is reportedly interested in bringing Lincecum back as a reliever and he is said to have drawn particular intrigue from San Diego and Baltimore. "If (a job) leads towards getting to a starter, I would want to work on that," Lincecum said. "I prefer whichever team needs me. Wherever, I've got to keep my doors open."